The RegexClean Transformation is all about cleansing data using regular expressions# by splitting, extracting and replacing tokens in your data within the pipeline. 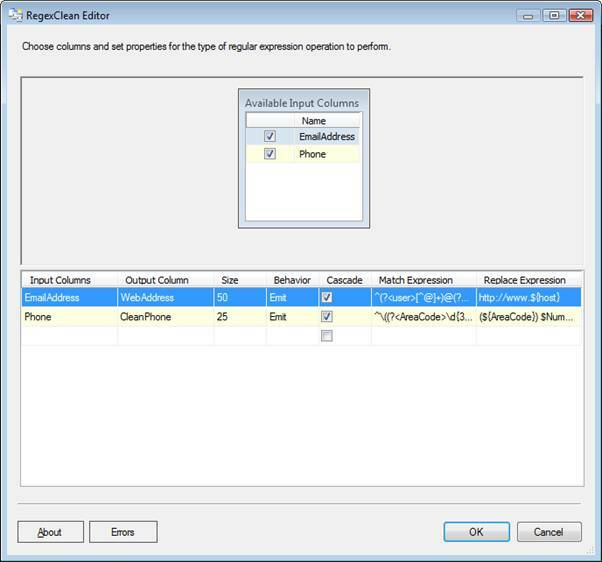 One or more columns can be selected, and match and replace expressions can be applied providing cleansed output data. If you want to use regular expressions to validate data then try our Regular Expression Transformation. The RegexClean Transformation is available free of charge from SQLIS.com, our free community resource site for SQL Server Integration Services.